I was anchored to the San Jose area for a little while as my daughter's high school volleyball participated in the CCS playoffs. Today they were playing an evening semifinal match in Gilroy so I decided to head down to the San Luis Reservoir to hike a trio of unnamed peaks in the Diablo Range foothills that surround the reservoir. The area is characterized by moderately rugged grass-covered hills with some oaks on the shadier north slopes in this otherwise dry landscape in the rainshadow of the range. The three peaks were all outside the state property boundaries, but much of the hiking was inside and provided the easiest access to these summits. These are the two most prominent summits, located north of the reservoir, nearly detached from the rest of the ran e by the Cottonwood and Romero Creek drainages. Though there are cheaper ways to access these peaks through the state property, I paid the $10 entrance fee at the west entrance to O'Neill Forebay which provides access to various campgrounds, day use areas and the Lower Cottonwood Creek Wildlife Area to the north. This separate unit is managed not by the State Parks system, but the CA Dept of Fish and Wildlife, primarily for hunting purposes. At one time used extensively for ranching as most of the lands further north still are, this area has been set aside for deer, pigs, turkeys and other game animals to roam, reproduce and thrive until people periodically come by and put small steel pellets in their heads. I could have done a better job of figuring out where to park and best access the wildlife area but didn't expect to find it fenced off from the recreation area that surrounds the reservoir and forebay. I ended up parking just outside the San Luis Creek Area Campground, possibly illegally, as I noted upon my return some pesky No Parking Between Signs signs right about where I was parked. No nasty notes or tickets to greet me, thankfully. After a short walk west along the pavement, I hopped a sturdy barbed-wire fence to gain access to the wildlife area and began walking down the old ranch road, periodically maintained to clear brush though no longer used for vehicles except those belonging to Fish & Wildlife personnel. A few deer took off when I first entered, the only game animals I saw the whole day. I followed the grassy road for several miles into the hills until I was at the base of a ridgeline heading NW up to Peak 1,331ft. A first fence is encountered just off the road, but another 2/3 of the way up the ridgeline marks the actual wildlife area boundary. The space between the two fences may act as a No Man's Land to keep hunters from accidently plugging a wayward cow or two. The occasional beer can and bottle found discarded along the route suggests this is more possible than one might otherwise think. Taking about an hour from the pavement, the summit of Peak 1,331ft offers some nice views of the surrounding countryside. The reservoir can be seen to the south framed by the higher Diablo summits around Laveaga Peak, with the forebay seen to the southeast. The Central Valley spreads across to east and though shrouded in fog and haze, the Sierra snowpack above Yosemite can just be seen in the far distance. Looking northwest I could easily identify the connecting ridgeline to reach Peak 1,300ft about two miles distance and headed off in that direction. After dropping to a low saddle and climbing the opposite side, I found a fenceline skirting much of this ridgeline separating two ranch properties. In various parts of the Romero Creek drainage to the east and north could be seen a few herds of grazing cattle. Above, a handful of ravens and redtail hawks circled the landscape above. Atop the second summit I reached 45min later is a large water tank that can easily be seen from SR152. Perhaps 15ft high, it must have been quite an effort to get it to the top of this hill where it has since fallen into disuse. 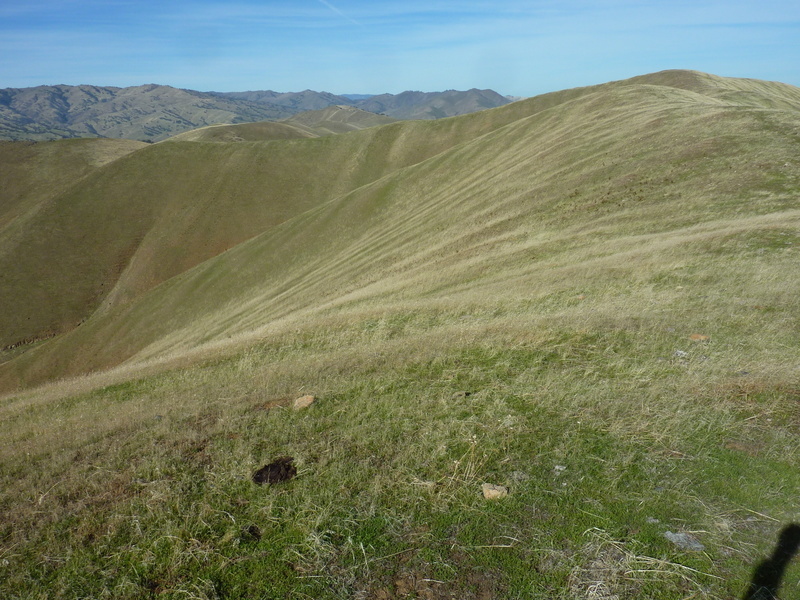 A flock of sheep could be seen far below in the Romero drainage, but I saw no trucks and no sign of people out tending the animals grazing the new grass that has begun to spring up over these hills. A few modest rainstorms have done wonders to the dry land as they start to green a bit earlier than usual. My return route was much the same, only shortened by not returning back over the first summit. With a few free hours still remaining before I was due in Gilroy, I paid a visit to a third summit to the south. This modest summit is found SE of the reservoir and just outside the boundary of the recreation area. It can be accessed via a dirt road off Basalt Rd. Not wanting to get in trouble for parking illegally along the road, I asked at the entrance kiosk on Basalt Rd where I might park. I was directed to the nearby campground where signs unequivocably indicate No Day Use. To be fair, the attendant was fairly new and wasn't very confident with her directions, but I didn't want to drive back out again and explore further options so I just parked in one of the many empty sites. In fact there were only two other sites out of perhaps 50 occupied, and one of these by the camp host who left me a note about my bad behavior for my return. I kinda expected it. From the campground, I wandered east through tall grass to meet up with the dirt road I wanted to hike to its end. From there it's a short uphill hike outside the recreation area to reach the highpoint above a transmission line and ranch road. I snapped a few unethusiastic photos (the air quality had grown considerably more hazy over the past few hours) and headed back down. I found an interesting collection of cattle bones, young and old, in a ravine I descended before going back through the fence to the recreation area.